It promises to greatly reduce the risk of illegal water abstraction, support significant improvement in water leak detection, improve the safety and efficiency of wastewater operations, and reduce the cost of policing illegal abstractions. The app also provides a platform for water utilities to eventually monitor and charge for abstraction in real time. 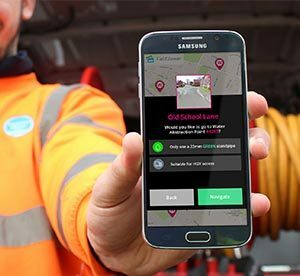 A team of Lanes Utilities managers and technical specialists, led by regional managers Craig and Casey May, have worked for more than 12 months to develop the app. Lanes Utilities Director Andy Brierley said: “This is a very exciting development, because it provides a solution for one of the major risks and problems faced by all wastewater maintenance specialists. Lanes Utilities, part of Lanes Group plc, is now rolling out the water abstraction app on its FieldViewer digital operational platform, developed by Techfinity, to support its wastewater network services contract for Thames Water. Across the UK, wastewater maintenance contractors abstract mains water needed for sewer and drainage system cleaning tasks tens of thousands of times every day. Abstraction licences are agreed locally with water companies. However, accurate maps of approved hydrants and wash out points are not made available. If the wrong ones are used, including ones owned by a neighbouring water provider, wastewater companies invariably face heavy fines. 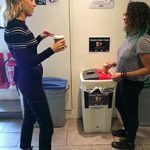 Early in 2016, Lanes Utilities, a UK leader in developing mobile app technology to enhance operational effectiveness, set out to solve this problem. Casey May said: “Working with Thames Water colleagues to obtain data about hydrant and wash out assets was the first major challenge, because it hadn’t been stored in a way that was easy to access. “We then had to verify the location and status of each abstraction asset by physically checking it, and assessing whether it could be reached by a jet vac tanker or a van pack unit. By chance, thousands of photographs, uploaded to FieldViewer by Lanes wastewater engineers when they abstracted water, could also be used. Each image contained the hydrant’s GPS coordinates and revealed which water company owned it through a system of colour-coding. Once this rough data set was gathered together, Craig and Casey May had to place the right information about the 130,000 hydrants, line by line, on a spreadsheet, ready to be uploaded onto the app. They used this data to create a trial version of the app, so they could test it in the field, as they worked with FieldViewer’s design and coding team over several months to fully develop its functionality. Craig May said: “The app is going to be a massive benefit to both us and to Thames Water. Our teams will be able to find the best abstraction location within seconds, saving us time and reducing the risk of unsafe operational practices. “A large proportion of water leaks are associated with these hydrants. We will be able to use the app to instantly alert Thames Water of any problems, which will result in less water lost, and reduced risk of fines for leaks.